This project is all about educating and engaging fellow Dorset dwellers with our fantastic local species. We have sharks in Dorset! Dorset Dorsals is a SharkStuff initiative to educate and engage the local public. Through a combination of free talks and eggcase hunts, we’re letting our community know that we share our coast with many species of shark and skate, and that sadly, lots of these species are at risk of extinction and need our help. Check out our Dorset Dorsals poster on the Useful Documents page for more information on some of our fantastic local species. 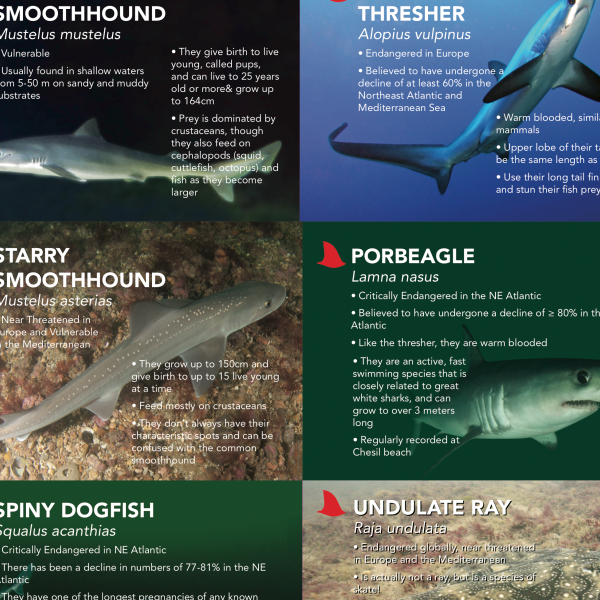 A snippet of our Dorset Dorsals poster, showcasing some of our sharks and skates! Book a talk or join us for an eggcase hunt! Talks can be booked by educational institutions, from primary through to tertiary, or by interested groups or organisations of all ages. Drop us a message through our contacts page for more information and booking. Eggcase hunts are held on local beaches – check our Facebook and Events page for dates and come join us!